The 2018-19 School Year brings exciting and healthy changes for every student enrolled in the Henry County School System! The Healthy Hunger Free Kids Act of 2010 required the United States Department of Agriculture (USDA) to update school menu nutrition standards to reflect the Dietary Guidelines. 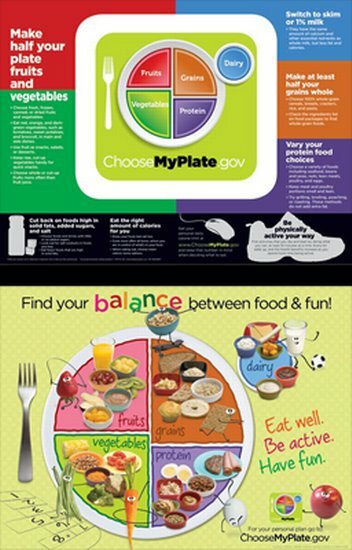 On January 26, 2012, Nutrition Standards in the National School Lunch & School Breakfast Program were published. Targets have been set and will be reached by the year 2022. Listed below are the requirements for all school meals where schools are participating in the National School Breakfast and Lunch Program. ~All lunch meals will include the following choices: Meat/Meat Alternate, Bread/Grain, Vegetables (includes weekly minimums for the following vegetable subgroups- Dark Green (1/2 cup),Red/Orange (1 1/4 cups), Dry Beans or Peas (1/2 cup), Starchy (1/2 cup) and subgroups categorized as "Other" and "Additional." (3/4 cup), Fruit, and Milk. ~Amounts of Fruit that each student is offered: One serving daily which must equal 2 1/2 cups per week for grades K-8 and 5 cups per week for grades 9-12. ~Students will be offered a weekly vegetable total of 3 3/4 cups for grades K-8 and 5 cups per week for grades 9-12. Students are offered 3/4 cup of vegetables daily for grades K-8 and 1 cup for grades 9-12. ~The Breads/Grains offered must be WHOLE GRAIN. There is now a weekly minimum and weekly maximum requirement for the Bread/Grain Group. ~All Henry County School Cafeterias will serve ONLY Low-Fat Unflavored Milk and Fat-Free Flavored (Chocolate) Milk daily with lunch. Daily breakfast meals will include 1 cup of fruit, one ounce of whole grains, and 8 oz of milk along with at least one ounce of meat or meat alternative. For more information, READ THE DOCUMENTS POSTED ON THE RIGHT SIDE OF THIS WEBPAGE. These will help you as a parent make healthier choices & become a healthier role model for your children. A child is more likely to try new foods if first introduced to them at home!